Donald Siegel is the new director of the School of Public Affairs in the College of Public Service and Community Solutions at Arizona State University. He replaces Karen Mossberger, who remains a professor and is working on two books and other projects that she had put on hold. Siegel is quick with a smile and direct with his words. With more than 900 undergraduate and graduate students, Siegel assumes the leadership of one of the top-ranked schools in the world for public administration research and graduate education. Siegel is no stranger to Arizona State University and downtown Phoenix. He was an economics professor at the ASU West campus and taught MBA classes at the ASU Mercado campus off Van Buren and 7th Street. An accomplished researcher, administrator and journal editor, Siegel joins ASU from the University at Albany, SUNY where he was a professor of management and dean of the School of Business for eight years. Siegel also taught and served in administrative roles at Stony Brook University, Rensselaer Polytechnic Institute, Nottingham University, and the University of California, Riverside. In 2016, Siegel was elected a Fellow of the Academy of Management, an honor bestowed on less than one percent of the Academy’s 21,000 members, for his significant contributions to the science and practice of management. Under Siegel’s leadership, the business school at UAlbany was awarded more than $13 million in research grants and received $21.4 million in gifts and donations, including the naming of its $54 Million building, which was ranked #4 in the world. During his tenure as dean, the school also developed New York state’s first undergraduate degree program in digital forensics, new undergraduate and graduate programs in entrepreneurship and cyber security, and an award-winning, community-based social entrepreneurship program with the School of Social Welfare. The school was also ranked #1 in the nation for three years in a row by U.S. News & World Report for MBA job placement. 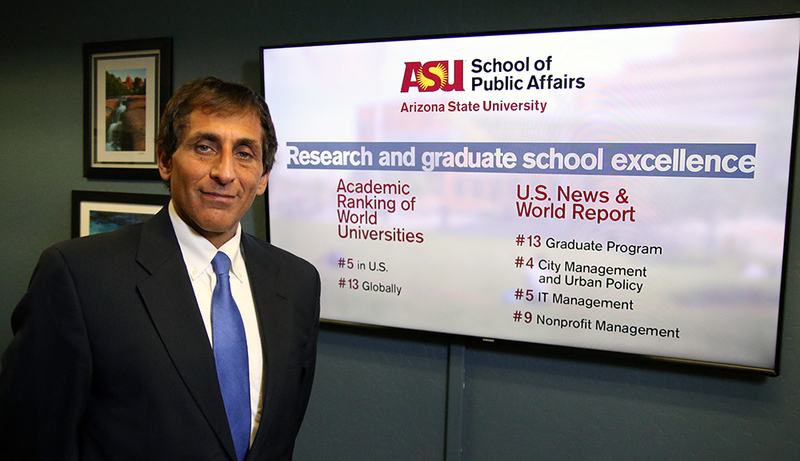 The ASU School of Public Affairs ranks No. 5 in the U.S. and No. 13 in the world for research, according to Shanghai Ranking Consultancy's Academic Ranking of World Universities. In 2016, U.S. News & World Report ranked its graduate programs No. 13 in the country, tied with such elite private institutions as Columbia, Duke, Carnegie-Mellon, and the University of Chicago. The school did even better in specialized ratings. U.S. News ranked the School of Public Affairs as No. 4 in the nation in city management and urban policy, No. 5 in information and technology management, and in the top 11 for environmental policy and management, nonprofit management, public finance and budgeting, and public management administration. The school is home to ten research centers and initiatives including the Center for Policy Informatics, the Center for Urban Innovation, and the Center for Science Technology and Environmental Policy Studies. Another, the Center for Organization Research and Design, recently launched an outreach campaign to promote its work on local government sustainable purchasing policies and practices. In addition to his administrative duties, Siegel will continue his own funded and scholarly research, including two recent NSF grants, which focuses on university technology transfer, entrepreneurship, and social responsibility. Siegel has published 12 books and 112 journal articles in leading journals in economics and management. His citation count, according to Google Scholar, is 32,562, with an h-index of 68. Siegel is an editor of the Journal of Management Studies and the Journal of Technology Transfer, an associate editor of the Journal of Productivity Analysis. He also serves on the editorial boards of Academy of Management Perspectives, Academy of Management Review, Academy of Management Learning & Education, Journal of Business Venturing, Corporate Governance: An International Review, Strategic Entrepreneurship Journal and the British Journal of Management. He has also co-edited 46 special issues of leading journals in economics and management. Staying active as a researcher and an editor is important to Siegel. A priority for Siegel is student success. Many students in the School of Public Affairs are the first in their families to attend college, which can be difficult for students with limited resources. Raising money for scholarships will be an important part of Siegel's job. Siegel plans to develop stronger connections between the school and government, nonprofits, and the business community in downtown Phoenix. He wants these institutions to partner more with the school and its outstanding students and faculty. Siegel wants to collaborate with other ASU schools and outside organizations to ensure students graduate with the knowledge and skills needed in a fast-changing workplace. First up, a new undergraduate concentration focusing on government/public procurement developed by professor Nicole Darnall. In January, the School of Public Affairs will welcome its first cohort of executive MPA students. Aimed at mid-level public managers, the online graduate program will feature in-person sessions in Phoenix and Washington, D.C. Classes will be taught by professors with specific expertise from the school, the Thunderbird School of Global Management, the W. P. Carey School of Business and the McCain Institute for International Leadership. Reaching out to alumni is another important step for Siegel. He hopes to better engage past graduates in the hope of raising the school’s profile and increasing opportunities for alumni and current students.